LG Tone Studio is a wireless wearable speaker | What Hi-Fi? We've all worn a pair of headphones before, but would you wander out of the house wearing a wireless speaker? 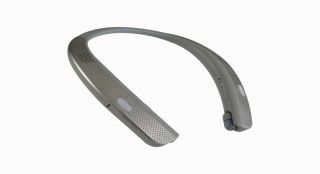 LG's new Tone Studio (HBS-W120) is just that - a wireless, wearable speaker, designed to hang around your neck. The speaker features four drivers, with two full range on top and two vibrating drivers underneath. It's equipped with LG's Hi-Fi DAC and a Dual Play feature - the latter allows you to connect two Tone Studios and share music between them. Looking at the image above, it also appears that the Tone Studio has integrated earbuds attached to the neckband, so you'll have the option of using the Tone Studio as a wireless speaker or pair of in-ear headphones. At CES 2017, LG will also unveil its Tone Free headphones, the HBS-F110. They're the company's first properly wireless in-ear headphones. You'll be able to store them in the accompanying neckband which also doubles as a charger and vibrates to alert you of incoming phone calls and text messages. Other LG headphones you can expect to see at CES 2017 include the Tone Infinium (HBS-920), which feature LG's Metal Layer Speaker Technology and the Tone Ultra (HBS-820), developed with the help of audio experts JBL. We'll look to bring you more information, including pricing and launch dates for all these products from the CES show floor.